We had a wonderful experience last night at the 12th Noir City Film Festival, held at the venerable Egyptian Theatre on Hollywood Boulevard. We saw SO EVIL MY LOVE (1948) with Ray Milland, followed by Jacques Tourneur's EXPERIMENT PERILOUS (1944) with George Brent and Hedy Lamarr. More on those fascinating movies later. During my teenage years I was a frequent visitor to Hollywood stores selling film memorabilia, such as Larry Edmunds Bookshop and the now-defunct Collectors Bookstore. By the mid-'80s the Boulevard had become so seedy I stopped visiting, except for a couple trips to see live theater at the Pantages. I was pleasantly surprised by the changes which had taken place in that area since my last visit. (Coming soon: a Hard Rock Cafe.) 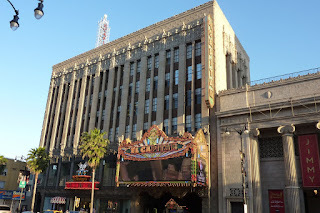 We enjoyed strolling around the Chinese Theatre, which I hadn't visited for decades. We had fun being "tourists" and photographing many more handprints and stars; the above gives a small sample. Seeing black and white movies on the "big screen" takes me back to my teenage years spent in the revival theaters of Los Angeles. As much as I love being able to watch movies at home whenever I have time, there is still nothing like seeing a movie -- especially a black and white movie -- on the screen with an appreciative audience, completely enveloped in the film's atmosphere. I wish I had time to return to see films like the San Francisco-based WALK A CROOKED MILE (1948) or Andre De Toth's DARK WATERS (1944) with Franchot Tone and Merle Oberon. Tonight's films include THE LOCKET (1946), a terrific psychological thriller. SO EVIL MY LOVE and EXPERIMENT PERILOUS were excellent; the mood and visual style of EXPERIMENT PERILOUS, in particular, will stick with me for a long time. Reviews of both films will be posted later today. Update: The reviews of SO EVIL MY LOVE and EXPERIMENT PERILOUS have now been posted. I am so envious...but pleased to hear you had such a swell time. And the pictures are first-rate! Awesome post Laura. Sounds like you had a great time. Thank you, Monty, I'm delighted to know you enjoyed it. How neat! I can't wait to read your reviews. Sounds like you had fun in the area. So glad to hear that the Larry Edmunds bookstore is still there. I bought a bunch of 8x10 movie photos when I was there last in 2008. That's a neat place to buy pictures while you are right there on the Hollywood Walk of Fame. I bought a picture of Jimmy Stewart there and then posed with it next to his star. Wow Laura! This is my dream trip! I'm so happy for you that you got to see all this. Thank you so much for sharing with us. I love tagging along on your adventures! Thank you, Casey! I'm so glad to know you and others enjoyed this peek at our fun evening.